The vision for their wedding day was the perfect example of classic elegance, tying in golds and other neutral tones as a beautiful compliment to the unique wooden architectural lines of the Entertainment Center. "One of my favorite moments from the day was when I walked through the Keeneland tunnel to meet Clint near the track for our first look. I will remember his smile for the rest of my life!" Guests were treated to a refreshing lemonade as they arrived to the outdoor summer ceremony. The cocktail hour featured hors d'oeuvres including Corn Cake and Pimento Cheese Sliders, Crudité Shooters, Mini Kentucky Hot Browns and Crab Cakes. For their main course, the couple chose a stationed meal that included Fruit and Cheese, Carved Sirloin and Salmon, Caprese Skewers, an Ahi Tuna and Satay Action Station, as well as Shrimp and Grits. For a night cap, late-night snacks of Cheeseburger and Fried Chicken Sliders were also shared with guests. 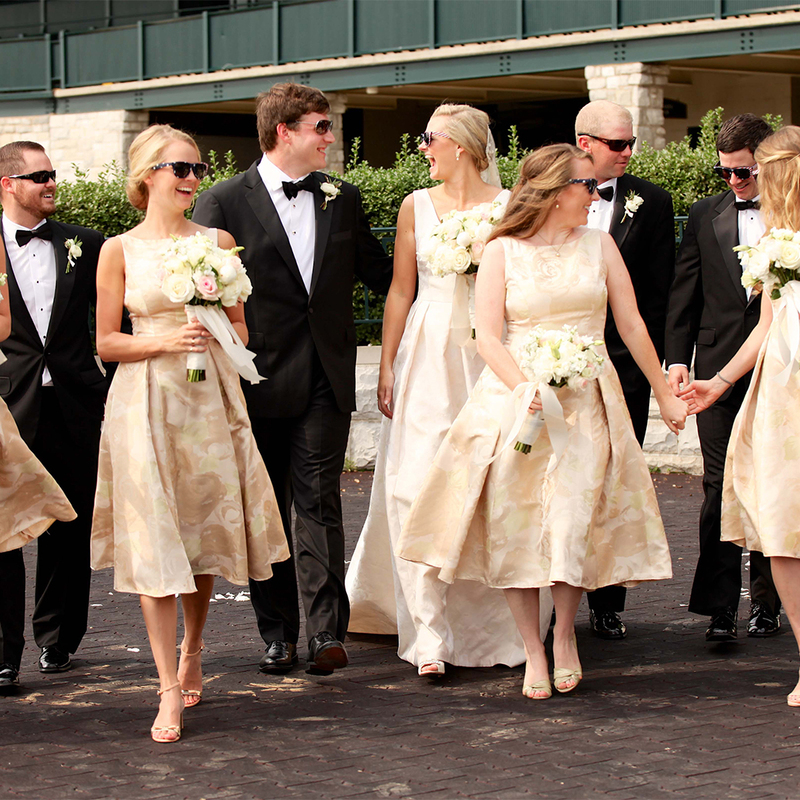 The Keeneland Team worked with Melody Rogers of Refined Social to plan and decorate the special day. The wedding was stunning and elegant, though Adair's fun and carefree side was evident when she replaced her heels with her favorite pair of Sperry's. Tell us more about your sepcial day. "Our wedding day was absolutely perfect. The sun was shining, Keeneland was beautiful, the food was delicious, the drinks were flowing and all of our favorite people were there to celebrate with us." "One of my favorite moments from the day was when I walked through the Keeneland tunnel to meet Clint near the track for our first look. I will remember his smile for the rest of my life! Looking back at pictures from that unforgettable moment, we were both so happy and I like to think that it set the tone for the rest of the day and evening." "At the end of the night we walked out from our reception under a shower of sparklers to the limo. From start to finish, the day was wonderful thanks to Keeneland and Melody with Refined Social Events."